You are here: Home / Your dog is not a wolf. I’m going to go out on a limb here and potentially upset a lot of hard nosed dog owners, but I’m actually going to completely oppose that myth. You see, there’s a problem with this philosophy that a dog shares it’s behavioral instincts with it’s wild brethren that I believe is directly resulting in a lack of understanding between man and dog. Sure, our dogs most certainly are descended from wild wolves, but our modern dog has been moulded into many shapes and sizes since we first started welcoming them into our lives; and their behaviour has adapted to suit this less survivalist and more comfortable way of life. That’s kind of what happens when you’ve been domesticated for the last 30’000 years. For me, the issue comes from a case of poor wording that leads to “Alpha syndrome”, which can occasionally cause an owner to be overly harsh with the manner in which they express themselves to their dog. This can be in the form of overly aggressive energy and body language, too much shouting, physical punishment, etc. But what if we swapped the “leader mentality” with a “parent mentality“? This would allow you to be firm, in control, and responsible without the ugly parts that can resemble a dictatorship. 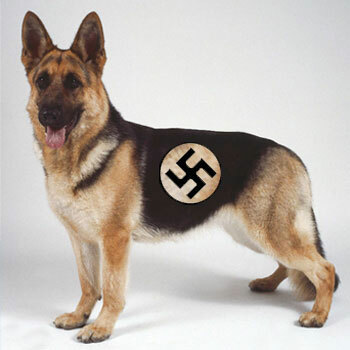 I like to believe The modern dog (not the type you see on the discovery channel during Wolf Week) desires safety, companionship and routine over a leader, and I like to think that a dog does what we say because they are highly responsive animals that are trained that the best option is always obedience. I just finished reading a study by a University in Canada which has had a breakthrough in research. It’s actually groundbreaking. Apparently, when a dog rolls over on to their back, they’re not always “submitting” like the wolf would in the wild. I really do wish that I had been at the study for this one, as I could have saved them an afternoon by sharing something many forget to consider, common sense based on observation. This article uses lines such as “we were surprised to find”, as if the world is hell bent on the idea that a dog is limited to a book of commandments written by the Wolf King of Wolverhampton. I believe the punishment for breaking “Thou shalt always bark at the postman” is genocide. The study does help breakdown this old fashioned way of thinking, and can be read here. If you ask me (and I’m very aware no one is), we shouldn’t be researching if rolling over is an act of submission, but if the modern dog even submits at all. In the wild, a submitting wolf would be one that bows to another wolf in an effort to avoid conflict or a power play for hierarchical position; and this is still the way behaviourists apply this term to our furry friends. On the other end of the spectrum you have “submissive” as to mean “responsive”. Is “submissive” behaviour in the vague forms of listening to an owners instruction, or the “eyes down, tail under” posture of a sorry dog even “submissive”? All-in-all, I think that “submit” is an ugly word that doesn’t particularly apply to our dogs anymore. Should we remind a dog that we’re the leader of a “pack” that the dog doesn’t understand to the fullest of a wild wolf by meeting aggression with aggression until they “give up”? Or should we teach the dog that we’re not stealing their food with productive techniques? 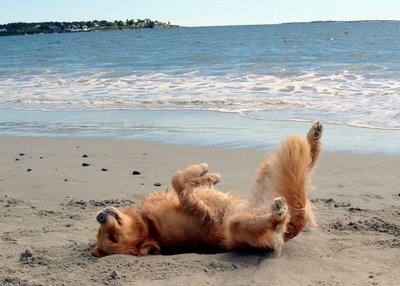 A dog submitting to the ocean. What about when a my dog approaches another dog in the park, and that dog responds by rolling over and letting them approach? That is pure submissive behaviour, right? That dog is clearly saying “I come in peace! Please take my land and please don’t start any fights!” I see this happening very often, all dog owners do. However, I think the dog is saying something very different – “come and smell me, I’m a dog and I quite like the attention. Also please don’t start playing and jumping on my face I’m not a spring chicken. Actually, I’m lying down like this so you don’t get the wrong idea”. The key difference is, this is no longer “submissive” in the sense people attribute it to the animal kingdom, it’s defensive and friendly. I think the philosophy in which a lot of owners take with their pets is detrimental to the relationship between man and dog. There is something majestic about the wolf and I think we romantacise our pets by embracing the biological connection they have with these wonderful animals a little to eagerly. In truth, The wolf is dramatically different in behaviour and instincts in comparison to a domestic dog; differences such as hunting, loneliness, affection, vocal communication, the space they need, their attitude towards man and other animals. Next time you’re comparing the actions of your dog to it’s ancestor, I think it’s wise to ask yourself if their actions or being driven by wild instinct, or a from a place that’s more in line with the world you created for them that they live in. As we’re discussing ways of thinking, It would be on topic to shine some light on the manner in which science and research can have an adverse psychological effect on us. We buy into the dog/wolf theory because we’re told it by people on TV and in books, just as we buy into other theories and products from other sources. I see this a lot with nutritional experts who preach raw feeding like it’s a religious code, when it’s quite clear that the ingredients is the most important factor over preparation. On the flip side you have those that preach that “Royal Canin” is gospel because it’s sold at their veterinary practice (It’s like you or I living off McDonalds), even we can be our own worst source, with many people still thinking their dog would die if they ate raw meat just as they themselves potentially would. We see famous dog trainers on TV teaching you how to “alpha roll” your dog when it’s not behaving because that’s “the wolf way”, when your dog in reality is just getting frightened of the aggressive action. All of these areas need to to appreciate that there’s more involved than what we’re told, by research, by professionals, by the companies that sell us food, by our own projections and most worryingly even our vets. This was really interesting. I have honestly never questioned it when people have talked about the alpha/pack thing in raising dogs. Call that laziness or just ignorance, I don’t know, but it just never occurred to me how absurd it is to treat a species of animal as if it was its ancestor. Your point makes sense, though. After all, we don’t raise our children after looking for inspiration in the parenting skills of other great apes. I don’t think our kids can cling to our backs the way our ancestors’ did, can they? Chimps are lovely enough, but I really don’t think we need to parent like them, so why raise a pup like a wolf? Thanks for sharing this, it’s really made me think about my own perception of dog behaviour.